Vegas with Dan's Parents - Tahiti Village — Always Packed for Adventure! We have just returned from a four day, three night, Las Vegas trip with Dan's parents. We packed it in! So much so, that I need to break the trip report into several blog posts just to cover it all. I've stayed at a majority of the major hotels on the strip, including a recent week long stay at the Palazzo. Yes, I've been spoiled. Until this weekend, it had not even occurred to me to stay off the strip. I thought that I would be missing out on being in the middle of the action and that it wouldn't feel like a proper Vegas vacation. Technically, I suppose we were still "On The Strip" as we were on Las Vegas Blvd, however we stayed beyond the "Welcome to Vegas" sign and our hotel had none of the normal Vegas trappings. 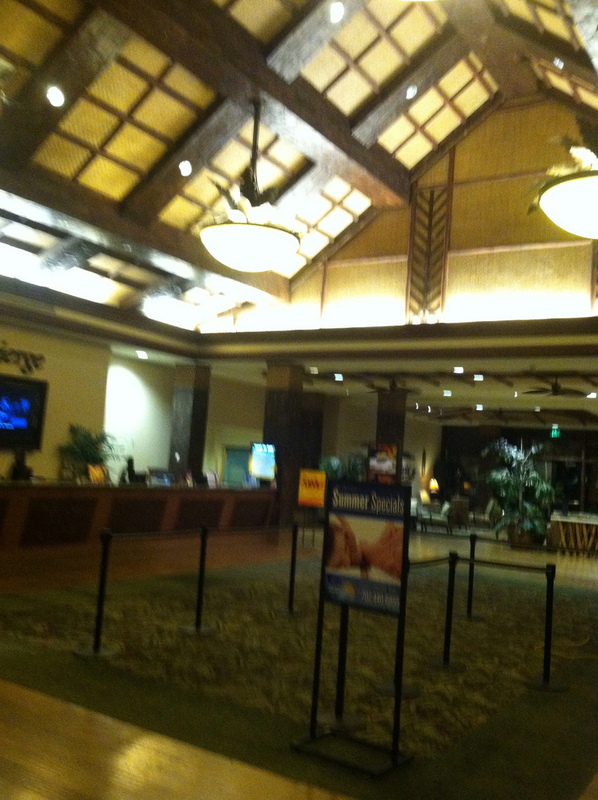 We stayed at the Tahiti Village. The Tahiti Village is part of the RCI Timeshare group and when not used by timeshare owners ,it is rented out as a hotel. We had the Royal Tahitian Suite, which was two adjoining rooms, each with it's own bathroom and a shared living room with a dining area and full kitchen. It was huge! Our bathroom had a jacuzzi tub and a shower that converted to a steam room. The kitchen was fully stocked with appliances and kitchenware. We only used it to eat breakfast, but it would have been great if we had stayed longer or wanted to eat in. We had a washer/dryer and used the dryer for our bathing suits. I think the Tahiti Village just might be my new favorite place to stay in Vegas. The pool is hands down, the best. It's broken up into two complexes. The main pool complex has one enormous pool with various entry points, including a sandy beach that was a big hit with small kids. It also had a side area with a net for pool volleyball. The area has so many pool lounge chairs, that we never had a problem finding a spot, which seems to always be a big issue at the major strip hotels. Here is a picture of the main pool complex. The second pool area is a lengthy lazy river with free tubes! I love, love, love lazy rivers. This sealed the deal for me. We spent several hours just floating around the river. It has about five water features, including a huge waterfall. It's definitely not for those who want to stay dry. I could have spent the entire vacation in the lazy river and would have been perfectly happy. Another great thing about the pool, were the drink prices. We got huge Mai Tais in a souvenir cup and they were only fourteen dollars. An equivalent drink anywhere else on the strip would have been easily over thirty. The bartender just kept pouring more and more alcohol in the cup. Speaking of the bartender, all of the staff that we encountered were super nice and helpful. We didn't make use of them, but the area also has a big BBQ area. There were lots of planned community activities, like games and movies shown in the pool. We drove to the strip each day, but they also have a free shuttle service, so technically you don't need a car. The lobby has free wifi and soon all of the rooms will too. Also coming soon is an adult only jacuzzi area, that is currently under construction. We didn't go to it, but the property has a small gaming area in an adjacent building, with a bar called Tahiti Joe's. They also have a day spa. I couldn't find anything not to like about Tahiti Village. We saw lots of families with small children and everyone seemed to be having a blast. I don't think that I've ever left Vegas feeling so relaxed. I feel like I just spent a week in Hawaii. Thank you lazy river! Here are a few more pictures of the property.